In 1881 the British Army was reorganised into territorial regiments with regular, militia and volunteer battalions. Prior to this, the Devonshire Regiment (known historically as the 11th Foot) consisted of 5 Volunteer Battalions. The 1st Rifle Volunteers were founded in 1851, an event which is commemorated by a statue in Northernhay Gardens, Exeter. The name "Rifle Volunteers" is still in use and since 1999 has been the title of the Infantry Territorial Battalion of the South West. The Battalion is formed from three of the finest Infantry regiments: The Light Infantry, The Devonshire and Dorset Regiment and the Royal Gloucestershire, Berkshire and Wiltshire Regiment. Elements of the Battalion are deployed on Operations in Iraq and have also been deployed to Afghanistan. Although there are a few older men listed among the Privates below, the majority were men in their late twenties and early thirties who would have formed a useful body of men. Captain Leopold Montague was the son of Arthur and Julianna Montague who lived at Penton House in Crediton. Lieutenant William Harris Heygate was a local GP in Crediton. In addition to these men there was a body of buglers. 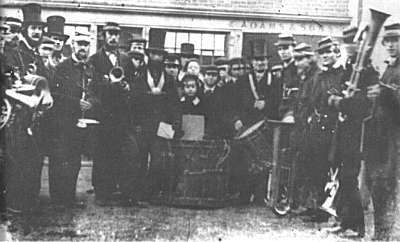 Crediton had a very active Town Band for many years and the buglers may not have been Territorial personnel.